A government shutdown is entering a third day - into the start of the work week Monday - after a bipartisan group of about 20 senators struggled Sunday to broker a government funding compromise. "Let’s step back from the brink. Let’s stop victimizing the American people and get back to work on their behalf," McConnell said on the Senate floor Sunday night. Senate Minority Leader Chuck Schumer responded that lawmakers have yet to reach an agreement on a path forward. "I am happy to continue my discussion with the Majority Leader about reopening the government. We've had several conversations, talks will continue, but we have yet to reach an agreement on a path forward that would be acceptable for both sides," Schumer said after McConnell spoke. A vote on ending debate and proceeding to the underlying funding bill--originally scheduled for 1 a.m. Monday is now slated to take place at noon. The House will return at noon on Monday as well as it awaits action in the Senate. Earlier Sunday, a bipartisan group of Senators presented their ideas to McConnell and Schumer and the two leaders then met behind closed doors to discuss. One senator in the bipartisan working group, Republican Senator Lindsey Graham of South Carolina, had said he was hopeful a solution could be reached Sunday night. "If it doesn't happen tonight, it's going to get a lot harder tomorrow," Graham told reporters. Later, on the Senate floor, McConnell proposed that if no immigration agreement is reached by Feb. 8 it would be his "intention" to take up "legislation that would address DACA" - referring to a legislative fix for the Deferred Action on Childhood Arrivals program. That promise apparently was not good enough for Democrats who want protection for some 800,000 undocumented immigrants brought to the U.S. illegally as children. After McConnell also pledged to not "prejudice one bill over another," Republican Senator Jeff Flake of Arizona announced he would vote for the government funding bill he opposed on Friday night. Graham said he, too, would vote yes if McConnell promised to bring up a bill Democrats want to protect the so-called Dreamers. Asked about the criticism from Schumer and other Democrats that they can't trust the president to make a deal, Graham said, "Well, he's still the president, and a lot of people on our side don't trust Chuck. I'm not asking people to trust anybody, I'm asking people to grow up and realize we are in charge of the House and Senate and that we have an obligation to work across the aisle." As the Senate got underway Sunday, finger-pointing on both sides of the aisle continued on the Senate floor as McConnell and Schumer blamed each other for the impasse. McConnell said Schumer has made the "extraordinary and destructive choice" to filibuster instead of compromise to end the government shutdown. "Now it's the second day of the Senate Democrat shutdown filibuster and the Senate Democrats' shutdown of the federal government because the president wouldn't resolve months of ongoing negotiations over massive issues in one brief meeting and give the Democratic leader everything he wants," McConnell said in a speech on the Senate floor just after 1 p.m. "My friend across the aisle has shut down the government for hundreds of millions of Americans." He said Schumer and the Democrats were needlessly displaying "pure political folly." He said bipartisan negotiations over DACA have been underway for months, "but they can go nowhere until the Senate Democrats realize the extreme path their leader has charted leads them nowhere." “The way out of this is simple — our parties are very close on all of the issues we have been debating for months now, so close I believed we might have a deal twice, only for the president to change his mind and walk away," Schumer said. "The president must take yes for an answer. Until he does, it's the Trump shutdown." Schumer said during his meeting with Trump on Friday he offered to compromise by tentatively agreeing to fund a wall on the Mexican border in exchange for DACA protections. “The president picked a number for a wall, I accepted it. It wasn't my number. It wasn't the number in the bills here. He picked it," he said. "Now, it would be hard to imagine such a more reasonable compromise. All along, the president is saying, well, I will do DACA and Dreamers in return for the wall. He's got it. Can't take yes for an answer. "We are a government that can only operate if the majority party, the governing party, accepts and seeks compromise," Schumer added. "The majority, however, has forgotten the lesson of the Founding Fathers. They have shown that they do not know how to compromise. Not only do they not consult with us, they can't even get on the same page with their president, a president from their own party. The congressional leaders tell me to negotiate with President Trump. President Trump tells me to figure it out with the congressional leaders. This political catch-22, never seen before, has driven our government to dysfunction." He said the reason for the dysfunction is a "dysfunctional president." "Hence, we are in a Trump shutdown and party leaders who won't act without him," Schumer said. "It has created the chaos and the gridlock we find ourselves in today. It all really stems from the president, whose inability to clinch a deal has created the Trump shutdown." Instead, he was working the phones - at least calling Republicans - according to the White House. Deputy White House Press Secretary Hogan Gidley said on FOX News that the president might speak to the American public on Monday. He said Trump had spoken on the phone Sunday with House Majority Leader Kevin McCarthy, Sen. John Cornyn, and Secretary of Veteran Affairs David Shulkin and Secretary of Homeland Security Kirstjen Nielsen. 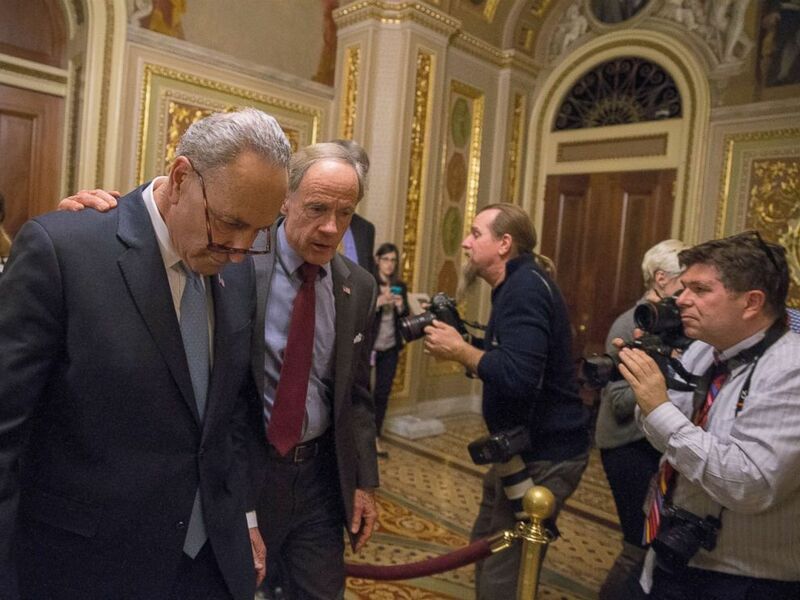 WASHINGTON, DC - JANUARY 19: (L-R) Senate Minority Leader Chuck Schumer (D-NY) and Senator Tom Carper (D-DE) walk out of a Democratic Caucus meeting at the US Capitol on January 19, 2018 in Washington, DC. Threats to use the "nuclear option"
In a Sunday morning tweet, Trump accused Democrats of wanting illegal immigrants to "pour into our nation unchecked" and suggested Republicans should use the "nuclear option" - changing longtime Senate rules to allow a simple majority vote of 51 (rather than 60) — to vote on a long-term budget if the shutdown continues. The cloture vote would need 60 votes in the Senate to pass — meaning it would need some Democratic support unless the "nuclear option" is used. Mulvaney weighed in on the nuclear option on CNN's "State of the Union" Sunday, describing the nuclear option as one option to break the stalemate. "We've been critical of that 60-vote rule since the president took office. And I think what the president did this mooring is tried to shed some light on the fact that if ordinary rules prevailed, the majority ruled in the senate, the government would be open as of today," Mulvaney said. House Speaker Paul Ryan on CBS' "Face the Nation" on Sunday said the House stands ready to pass the three-week extension if the Senate is able to pass the measure. "We have agreed that we would accept that in the House, and so we will see some time today whether or not they have the votes for that," he said. "And that's really where we are right now." ABC News's Meridith McGraw, Michael Conte and Brandon Chase contributed to this report.